Check out our Blu-Ray and DVD player reviews, and find the best Blu-Ray or DVD player in the UK. The Panasonic DMP-BDT180EB 3D Blu-Ray player is a good choice if you don't need a Wi-Fi connection. This model offers excellent picture quality, with 4K upscaling of Blu-Ray disks, and upscaling of DVDs to Full HD. A wide range of audio formats is supported too. In addition, the ethernet port allows connection to the internet for access to the BBC iPlayer, as well as Netflix and YouTube. If you want a Blu-Ray player that plays disks and ... well, nothing else really, then the LG BP250 is a good, cheap choice. It has no 3D capability, but will upscale DVDs to Full 1080p HD. For the price, you really can't go wrong. The Panasonic DMP-BDT380EB Smart 3D Blu-ray Player is a fully-featured Blu-ray player, offering high-quality playback with 4K upscaling, playback of 3D Blu-ray disks, and support for optical digital audio output. With built-in Wi-Fi and ethernet connectivity, the device includes BBC iPlayer, Netflix and YouTube apps, but its Smart TV & catch-up TV isn't quite as polished as rival models from Sony or Samsung. 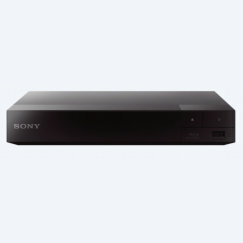 The Sony BDP-S3700 Blu-Ray player is an excellent mid-range device, offering playback of 2D Blu-Ray disks, DVDs & CDs, as well as streaming content from Netflix, the BBC iPlayer and from connected smartphones, tablets and PCs. Fast Wi-Fi support is built-in, and the balance of features will be just right for the majority of users. 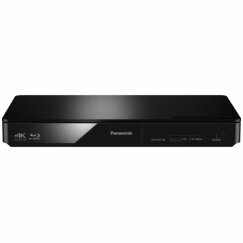 The Panasonic DMP-BD84EB-K smart network Blu-Ray disc player is a very basic entry-level player. It includes ethernet connectivity with simple Smart TV functionality (Netflix, YouTube and a few other apps), but no Wi-Fi support. It's super-compact, but over-priced at launch. Our target price for this model is �50, and at that price it would be a good buy. The Sony BDP-S1700 Blu-Ray player is Sony's entry-level model for 2016, yet it still includes support for the Sony Entertainment network, giving you access to a range of Smart TV services, including the BBC iPlayer, YouTube, Amazon Instant Video, Netflix and YouTube. 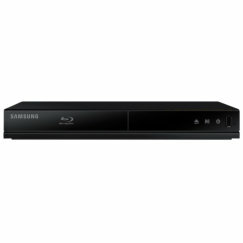 The Samsung BD-J4500 Blu-Ray & DVD player is a budget player available for �50 or less. The player has been stripped to its essentials, including support for 2D Blu-Ray, DVD and audio CDs, but no 3D support, no internet connectivity, and no Wi-Fi. The Panasonic UB300EB UHD Blu-Ray player brings you the pin-sharp quality of 4K HDR for not much more than the price of a regular Blu-Ray player. 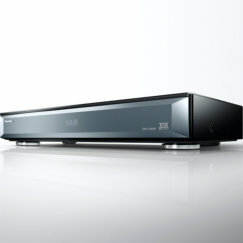 The UBD-K8500 is Samsung's first Blu-Ray player to support the new UHD Blu-Ray disk format. With this player you can experience the very highest quality movies available, with 4 times the resolution of Full HD, 10 bit colour, and High Dynamic Range (HDR). But it's expensive, and you'll need a top-end TV to enjoy it to the full. The Panasonic DMP-UB900 UHD Blu-Ray player is the first of a new breed. UHD Blu-Ray offers significantly enhanced quality compared with conventional Blu-Ray, with 4 times the number of pixels, plus much greater detail thanks to HDR. The UB900 is expensive compared with ordinary Blu-ray players, but if you have a high-end TV, this player will unlock its true potential. LG BP125 review - The LG BP125 is a cheap, ultra-compact Blu-Ray player with a tiny footprint ideal for cramped spaces. LG BP325 review - The LG BP325 is a compact Blu-Ray player that includes 3D playback and an ethernet connection. For the money, you probably won't find another player that offers as much. LG BP340 review - The LG BP340 is a cheap and basic Blu-Ray player with the ability to connect to a home network via Wi-Fi. This lets you access music, photos and video wirelessly. LG BP350 review - The LG BP350 smart Blu-Ray and DVD Player with built-in Wi-Fi is a good basic disk player with the advantage of Netflix, Amazon Instant Video, YouTube, Now TV, Spotify and the BBC iPlayer all available. LG BP420 review - A good value Blu-Ray player with Smart TV and 3D playback. 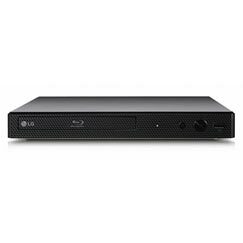 LG BP450 review - The LG BP450 is a very good value Blu-Ray disk player. For as little as �50 you get a system capable of playing both 2D and 3D Blu-Ray disks, with BBC iPlayer, Netflix, Now TV and Amazon Instant Video apps included. An optional Wi-Fi accessory unlocks additional functionality, including smartphone content streaming. LG BP520 review - A good value Blu-Ray player with Smart TV, 3D playback and optional Wi-Fi. LG BP620 review - An excellent Blu-Ray player with Smart TV, 3D playback and built-in Wi-Fi. It's a bargain! LG BP640 review - The LG BP640 is a simple, value-for-money Blu-Ray player that covers all the most-used features, including 3D playback, networking and Smart TV. Panasonic DMP-BDT120 review - Best-in-class picture quality, 3D playback, Smart TV and excellent connectivity put this entry-level player ahead of its rivals. Panasonic DMP-BDT130 review - This entry-level player provides best-in-class picture quality, 3D playback, Smart TV and outstanding connectivity. Panasonic DMP-BDT160EB review - This entry-level Blu-Ray player is cheap and includes 3D playback and Smart TV, but connectivity options are limited. Panasonic DMP-BDT170 review - The Panasonic DMP-BDT170EB smart 3D Blu-Ray player features best-in-class picture quality, with 3D playback and upscaling to 4K. However, it's missing out on Wi-Fi connectivity, and its Smart TV functions aren't good enough to match other brands. Panasonic DMP-BDT220 review - The best reasonably-priced Blu-Ray player we've tested. 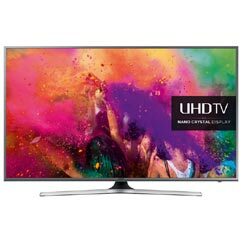 Outstanding picture quality, Smart TV, and built-in Wi-Fi mark this out as a winner. Panasonic DMP-BDT230 review - Top 2D & 3D picture quality, Smart TV, built-in Wi-Fi and display mirroring make this Blu-Ray player an outstanding addition to your home entertainment system. Panasonic DMP-BDT270 review - The Panasonic DMP-BDT270EB adds Wi-Fi networking to the capabilities of the BDT-170, making it a great choice of budget Blu-Ray player. It's rare to find 4K upscaling in a sub-�100 player, but the BDT270 includes this, plus 3D playback, and Smart TV apps including BBC iPlayer, Netflix, Amazon Instant Video and YouTube. The Miracast feature uses the built-in Wi-Fi to support screen mirroring from smartphones and tablets. 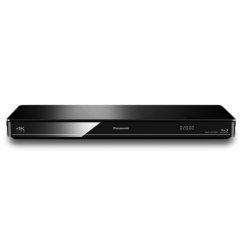 Panasonic DMP-BDT280 review - The Panasonic DMP-BDT280EB is an excellent mid-range Blu-Ray player with support for 3D playback and upscaling to 4K resolution. It supports a fair range of Smart TV services including the BBC iPlayer and Netflix, and includes built-in Wi-Fi and ethernet connectivity. You can also stream content from your home network using DLNA, Wi-Fi screen mirroring from a smartphone or tablet, or a connected USB device. Panasonic DMP-BDT460 review - The Panasonic DMP-BDT460EB is a premium Blu-Ray player with smart looks to match its high price. It's worth the money, as it's one of the best performing players available. As well as top video quality with 3D playback and 4K upscaling, it delivers an impressive audio performance, and supports twin HDMI output and digital audio out. Also included is Wi-Fi and ethernet connectivity, and a range of Smart TV and media streaming options. There's really nothing missing! Samsung BD-E5300 review - This entry-level Blu-Ray player is a real bargain! Samsung BD-E5500 review - This inexpensive Blu-Ray player offers 3D playback, plus excellent connectivity, including a Wi-Fi option. Samsung BD-E6100 review - A superb Blu-Ray player that does pretty much everything you could ask, yet costs little more than �100. 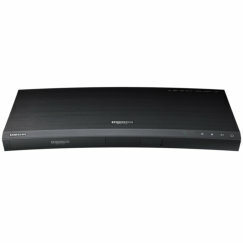 Samsung BD-F5100 review - This compact, entry-level Blu-Ray player offers great value for money. Samsung BD-F5500 review - The BD-F5500 Blu-Ray player includes 3D playback and native apps for BBC iPlayer, LoveFilm and YouTube. Samsung BD-F6500 review - The Samsung BD-F6500 Blu-Ray player includes 3D playback, integrated Wi-Fi, Catch-up TV, Netflix, LoveFilm and 7.1 surround sound, making it the best of Samsung's 2013 range. Samsung BD-F7500 review - The Samsung BD-F7500 Blu-Ray player is expensive, but offers premium looks, superb Smart TV and networking, plus 4K upscaling. Samsung BD-H5500 review - The BD-H5500 Blu-Ray player includes 3D playback and apps for BBC iPlayer, Netflix and YouTube. It's excellent value, but lacks Wi-Fi support. Samsung BD-H5900 review - The BD-H5900 Blu-Ray player includes 3D playback, Wi-Fi and ethernet connectivity, and apps for BBC iPlayer, Netflix and YouTube. Samsung DVD-E360 review - The Samsung DVD-E360 is a basic DVD player with a rock-bottom price! 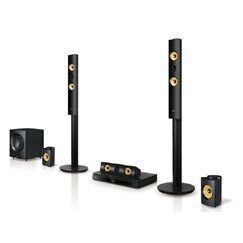 Sony BDP-S1100 review - This entry-level player in Sony's 2013 Blu-Ray range has a premium, stylish design, and is highly recommended. Sony BDP-S1200 review - This entry-level player in Sony's 2014 range has a premium, stylish design, and is a good basic Blu-Ray player. Sony BDP-S1500 review - The Sony BDP-S1500 is the company's entry-level Blu-Ray player for 2015 and includes all the essentials, plus a few extras such as Smart TV, an ethernet connection, a coaxial audio output and a super-fast start-up time of under one second. It just misses out on 3D playback and Wi-Fi connectivity. Sony BDP-S3100 review - This Blu-Ray player has a premium, stylish design and includes built-in Wi-Fi, but is missing the ability to play 3D disks. 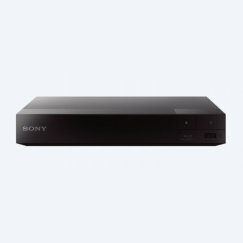 Sony BDP-S3500 review - The Sony BDP-S3500 is an excellent Blu-Ray player with Smart TV and built-in Wi-Fi. This enables you to wirelessly access catch-up TV, plus Sony's library of movies, music and games, and also to wirelessly stream videos, music and photos from your home network or smartphone. It just misses out on 3D playback and UHD (4K) upscaling. Sony BDP-S4100 review - The Sony BDP-S4100 is a 3D-capable Blu-Ray player with a unique design, but it misses out on Wi-Fi connectivity. Sony BDP-S4200 review - The Sony BDP-S4200 adds 3D capability to the S1200, and is a decent, but fairly basic Blu-Ray player with Smart TV functionality. Sony BDP-S4500 review - The BDP-S4500 is Sony's cheapest 3D Blu-Ray player for 2015. It also includes support for Smart TV via an ethernet cable, although there's no Wi-Fi option. Sony BDP-S5100 review - The Sony BDP-S5100 is a very capable Blu-Ray player with 3D playback, built-in Wi-Fi and Smart TV. Sony BDP-S5200 review - The Sony BDP-S5200 is a fully-featured 3D Blu-Ray player with Wi-Fi and ethernet connectivity. It's our top choice of Sony Blu-Ray players for 2014. Sony BDP-S5500 review - The Sony BDP-S5500 Blu-Ray player combines the best of the S3500 and S4500 models, providing 3D Blu-Ray playback and excellent connectivity, with Wi-Fi and Smart TV functions. It's a very versatile player and highly recommended. Sony BDP-S790 review - The Sony BDP-S790 is Sony's top-level Blu-Ray player with superior picture quality plus a mass of features including 4K upscaling.